In this free crochet pattern, large, solid-colored classic granny squares are joined together in a contrasting color to create a beautiful, modern blanket with a zig-zag border. Thanks for stopping by You Should Craft!! There have been lots of teasers on classic granny squares and join-as-you-go crochet tutorials, but the day is finally here — I finished my granny square contrast blanket and am going to share the pattern/tutorial with you, dear readers! If you’re a beginning crocheter, or someone who has never tackled a large project, this afghan is an excellent place to start. It only uses two colors, and is made by joining together a bunch of large granny squares. I found that the larger sized granny squares help to make a big project like an afghan feel like lots of smaller projects, which makes you feel accomplished. As a bonus, because it’s made of granny squares, you don’t have to carry a huge blanket around. You can easily bring your work with you on the train as you commute to work, or on an airplane as you fly to your cousin’s wedding. If you choose the latter, try not to drop your tapestry needle between the seats; you will never find it, even if the flight attendant feels bad for you and gets down on her hands and knees with a flashlight to help you look. Trust me. Caron Simply Soft is a worsted weight yarn and each skein contains 315 yards (288 meters). If you can’t find Simply Soft, you can replace it with any soft, worsted weight yarn. 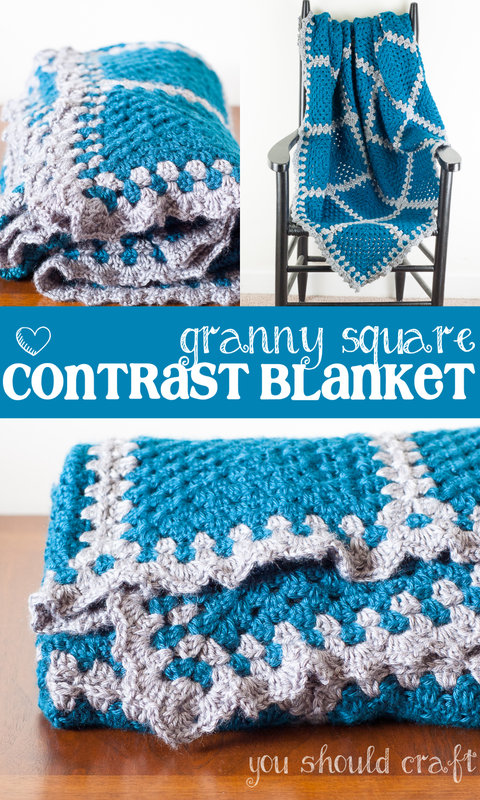 As written, the finished contrast blanket pattern produces a final product that is square and measures approximately 48 inches x 48 inches. However, you could easily adjust the size by adding more or less granny squares to your afghan. Do you have written patterns? Reading is much easier when I am getting cancer treatment.